With Memorial holiday giving us an extra day I was hoping for a bigger than normal adventure…but Brian couldn’t pull off two nights out. We had to make do with a single day with an early start. 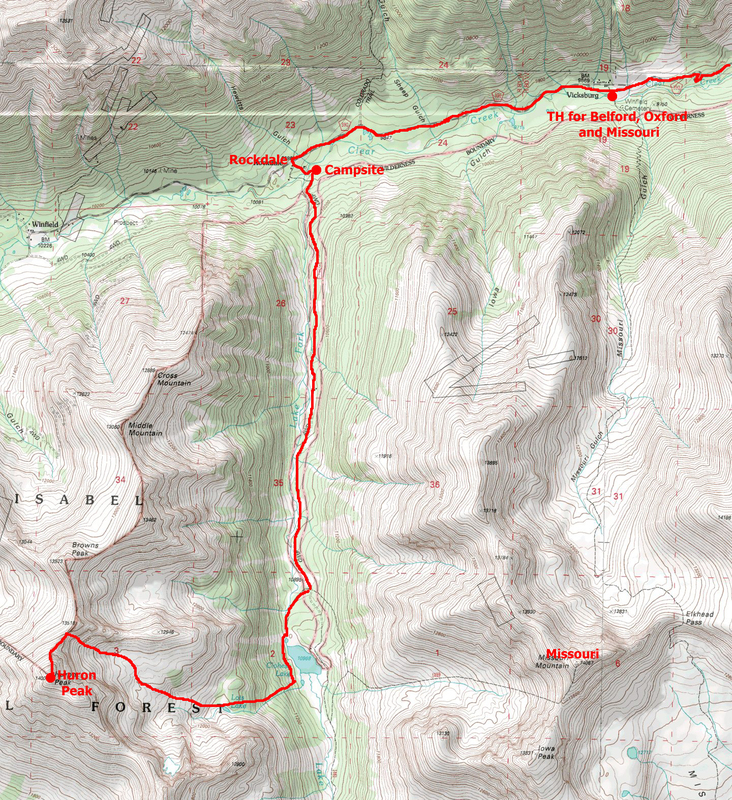 Brian suggested Antero, with the idea that we could get a good ski descent. 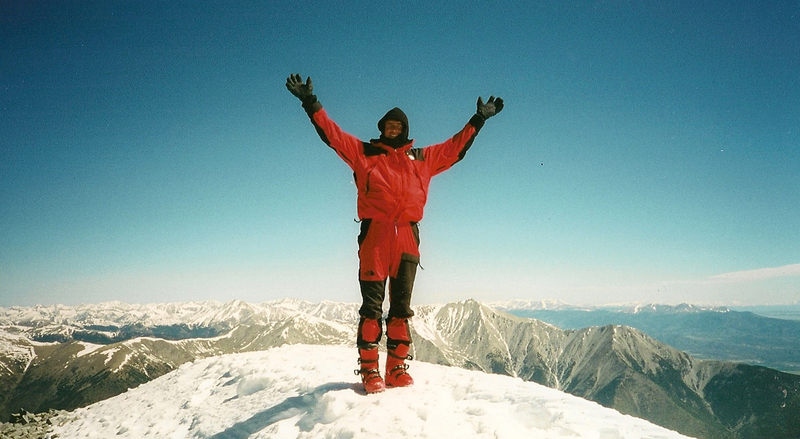 Since Antero was one of the few unclimbed Northern Colorado 14ers on my list, I loved the idea. The drive up, which started late due to my tardy arrival, was interrupted by a missed highway turnoff and an accident that closed the highway for an hour. To make use of the time and avoid eating dinner after midnight, we got out the stove and made dinner on the side of the road. And, it still might have turned out okay, except the approach road was very long and slow going. We made it to 11,300′ before stopping to setup camp; we settled in for sleep at 1am. With a 5am wakeup call forthcoming, it would be a short night. 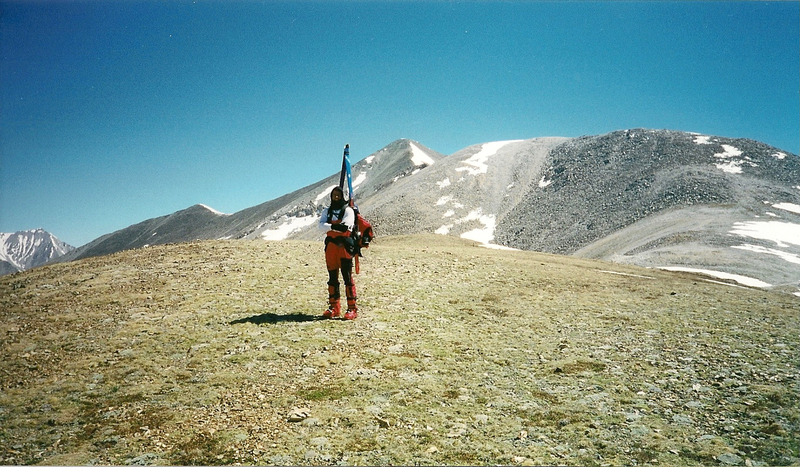 We started moving at 5:30am and took 3 hours to ascend from camp at 11,300′ to the Mt Antero summit at 14,269′. We followed the winding road up, but didn’t trust where it led after passing the summit ridge; we followed the ridge to the summit. Unfortunately, we also discovered that there wasn’t any snow left on Antero except for a thin strip about 50 feet wide and 500 feet tall on the southern ridge leading to the summit. We enjoyed the summit for a short time and discussed our options for the day. Since we couldn’t get our ski descent, we decided we’d head over to a tall peak across Baldwin Gulch that had a very nice snow covered eastern slope. But we had to hurry since the snow had been in the sun since dawn. We descended Antero following the old mining road which turned out to lead to the final stretch of the summit ridge. Once at the start of the switchbacks, we left the mining road and headed around the cirque toward the unnamed peak. Where's the snow? On the way to some snow on 'Ol Unnamed (North Carbonate?) from Mt Antero (in background). The progress was good until we got to the exposed scree & talus on the SE ridge of the unnamed peak. It was murder for tired legs. We found the summit to be protected by a weird cornice that required crawling over to get to the top of the peak. I needed a rest, but with the sun burning on the snow, we stopped only momentarily before setting off for the steep descent slope. As we feared, the snow was soft, and possibly dangerous. After a short pow-wow, we decided we’d proceed…with the extra precaution of staying on opposite sides of the face and only skiing one at a time. The snow turned out to be great, and we had a great time descending 1800′ in only a few minutes. 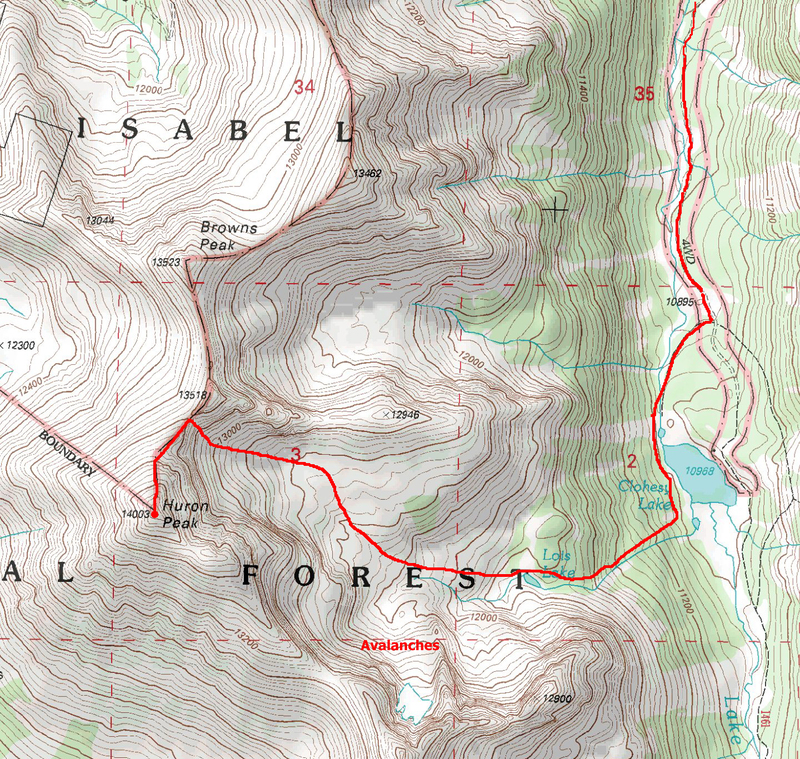 The hike out was mercifully short; we made it back to camp at 1:30pm for an 8 hour, 8 mile, and 4000′ day. And sometimes, one day is enough. In the years afterward, I came to believe that the peak had an unofficial name, “North Carbonate”. 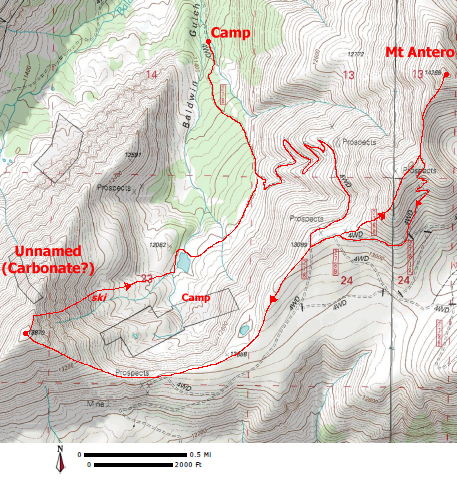 And, just recently, I discovered that the officially unnamed peak got an official name in 2005…it is now called Cronin Peak. One more time. Brian and I thought we’d back to the Clear Creek Reservoir Road, this time to collect Mt Huron. We knew going in that it would be a 10+ mile hike in the snow with a 4000′ elevation gain due to the winter road closure, but we were on a roll and Huron was next on the list. The only problem would be the inevitable snow storm; the previous week it snowed all the night before. And, it did so again. It was Brian’s turn to drive; we left his place in Golden @ 7:45pm on Friday (April, 23, 1999) heading toward Leadville. The Bronco is a slow beast, but it works wonders on poor backcountry roads. Along the way, we were pleasantly surprised to find the roads in better shape than the previous week (when we did Missouri Mountain) despite the heavy new snow in the front range. We figured we’d gotten lucky on the snow distribution. Brian picked the East Slopes route. At the time I figured it was the worst thing he could find, but in hindsight I suppose it might have been because Dawson wrote that the East Slopes generally have more snow. Well, we did have plenty of snow. Aiming for the Clohesy Lake trailhead, we pulled off US Highway 24 onto Clear Creek Reservoir (dirt) Road. We immediately knew we had been mistaken about getting lucky with the snow; the accumulation was much worse than the previous week. We drove past our previous camp at Vicksburg and to the Rockdale townsite where we turned onto the 4×4 road heading toward Clohesy Lake trailhead, but only managed to get 1/3 mile up the 3-mile road before the snow was too deep to drive even for the Bronco. And, believe me, that means something. A determined Brian forced his way cross Clear Creek before giving up on the drive; that crossing was much more interesting than I like at 11:30pm. We setup camp as quickly as frozen fingers allowed. And then sleep came quickly, and so did 5am. The first thing we noticed was the temperature. It was way too warm. Crap, it was going to be a hellish, soft snow day. The initial hiking over the 2.7 miles remaining of the 4×4 road was rather flat; we started at 10,000′ and took 1.5 hours to gain 800′ of elevation. I hoped in vain that it would be a nice downhill glide 10 hours hence. Still, it was an easy start, for me anyway. Brian broke trail; and for a change, he actually made a trail I could use instead of gliding across the surface like a modern day Legolas. It was odd to hear him grumble. Once we cleared the treeline, we could see heavy snow covering the ridges descending from Huron. It was still early and already a slide had occurred, nearly reaching our ascent path. We kept our distance from the snowy slopes as best we could, and we tried to hurry to minimize our exposure. But it was a long curving path to reach the couloir ascent to the summit ridge. The final couloir was very steep and icy. So, we didn’t have to fear an avalanche, but the skins were only marginally up to the task of ascending such a steep, slick surface. We slowly worked our way up until about 3/4ths of the way up we had to exit into the rocks on the right to make the saddle. The climb certainly would have been better with crampons and an axe. The weather had looked bad all day and continued to do so. We tried to hurry to the summit, but the snow on the ridge was too soft. I literally had to swim across the sections without rocks to step on. This misery was compounded by my agreeing to bring the skis to the summit, where we sat for only as long as it took to eat a quick snack. I carried the skis up to the summit and then carried them back down to just above the saddle. When I dared put them back on, the snow stuck to the base like tar. Fortunately, by the time we reached the top of the couloir, the skiing returned to a normal state for the day…merely terrible. A few turns into the descent, I hit a rough, icy section and lost it. I hit face first and cartwheeled down the slope, bashing my brains in on every flip. My self-arrest ski poles allowed me to stop after a few flips, but not before mutilating my nose. And this only 2 weeks since making a pact with God to take better care of my nose after allowing me to keep most of it after some frostbite on a cold, windy day on Mt Silverheels. I bled continually and fell frequently as I attempted to escape Huron with my life and the remainder of my health (and nose). Once we made it past the lake and reached the 4×4 parking area, the snow had softened enough to become impossible. In the last 3 miles, I fell through the snow 6 times. One time I could not get back up; it was a sort of quicksnow. I finally had to resort to rolling to escape the pit I dug for myself. We made it back to camp at 6pm for an 11.5 hour day covering 4000′ of elevation gain and 10+ miles of soft snow slogging. And, I was a bloody mess. Some trips it is hard to remember that I do this because I love it; but it is important that I remember it.